We’re especially proud of the award for “Best Health Food Menu.” We’ve worked hard to make our menu accessible to everyone, including those with special dietary needs like a gluten-free diet. In case you haven’t been in to one of our restaurants lately, throughout our menu, we use our “Eat’n Smart” symbol to denote items that are healthier with less calories, cholesterol, and fat. The back of the menu lists the items on our menu that will fit into celiac, reduced-sodium, and vegetarian diets. Some life changes seem to arrive with the seasons. I have two children in grade school, and each September brings the crush of the schedule back into our life from the carefree days of summer. School and homework would be enough, but there is also football, cheerleading, soccer, piano lessons, PTA, etc. When do we eat together?!?!? Often, this time of year, our options include more takeout. We don’t have time to cook and we don’t have time to sit down someplace, so takeout becomes our cook for the night. At Eat’n Park, we know many families face the same dilemma that mine does during this time of year, so we try to make our takeout satisfying for the whole family. Our menu already offers something for everyone, but we’re always looking for ways to improve our takeout service and food quality. Our sandwiches and salads travel especially well, but one of our most popular takeout items is the Quart of Soup. We have chili and chicken noodle soup available every day, plus our soup of the day (like my personal favorite, potato soup on Wednesdays and Sundays). As I mentioned earlier, we’re always striving to improve our takeout experience. So, we’d love it if you’d give our takeout a try, and comment back on this blog with what you liked and what we could do to make it even better. In fact, here’s a coupon for 20% off your next takeout order, valid through October 10, 2008 (click here). I look forward to seeing your comments! On Thursday, September 11, the state of Pennsylvania is going smoke-free. More than a year ago, on May 31, 2007, we decided to make all of our restaurants smoke-free voluntarily. It wasn’t an easy decision at the time. We knew that many of our guests would love the change, but we also knew that some of our guests who smoke would be disappointed by our decision. We’re in the hospitality business. Trying to make everyone happy is what we do. It’s in our blood! This would be a choice where we would have to make some people happy and others not. We have received tremendous positive feedback and support for our decision, and we have never regretted it. Our team members enjoy a healthier work environment, and we have heard from so many families who appreciate a place where they can dine smoke-free. To thank you for your support, we will be serving FREE Smiley cookies with dinner on Thursday, September 11 (from 5-8 pm). So, stop by your neighborhood Eat'n Park and enjoy a great dinner and a Smiley Cookie on the house! Hello, and welcome to our blog! My name is Jeff Broadhurst, and I am the President and CEO of Eat’n Park. We’re excited about this new feature, and we are hoping that we can connect with you through the blog and incorporate you into the Eat’n Park family. Obviously, the world we live in is constantly changing. The way we communicate today is far different from the way we did back in 1949 when our company first began, but we’ve always strived to hold on to those personal interactions that are so much a part of our history. This blog is an extension of that goal. We hope to share a bit of our culture with you through stories, recipes, and other information that we think you’ll enjoy. More importantly, we hope you’ll share with us – we want to answer those questions you’ve always had about Eat’n Park (how did we come up with that name, anyway?) and we want to hear your ideas, feedback, and hopefully, a few compliments too! You’ll be seeing a variety of topics here, ranging from our sustainability practices to menu development to our restaurant remodels. Some of our most innovative team members will be posting their thoughts, so expect information that you haven’t heard before. Check out the author bios on the right to see who you’ll be hearing from. So please, take a look and let us know what you think! We’re looking forward to hearing from you and very much appreciate your business. We are very excited to be working with a Pittsburgh-based singer to provide the musical sound of Eat’n Park. Sarah Marince, a Moon Twp., PA resident, is an aspiring country singer. She’s been opening for big name artists, including Taylor Swift, Trisha Yearwood, Kellie Pickler, Julianne Hough, and Reba McEntire, preparing to get her own big break. This summer, we wanted to share Sarah’s sound with our guests, so we took her on the road to perform outside various Eat’n Park restaurants. We had a blast and so did our guests. You can check one of Sarah's latest performances below, or see all of our videos here: http://www.eatnpark.com/newsVideo.asp. We thank Sarah for helping to make Eat’n Park the place for smiles this summer! I’m sure that all of you reading this have ordered hundreds of hamburgers in your lifetime. But did you ever stop to think about where they come from, who comes up with these great flavor combinations, and how do we know which burger out there is really the best one? Well, if those thoughts have been have been weighing on your mind, you’ve come to the right place because I have all those answers and more! First off, the hamburger ideas normally come from the imagination of the culinary equivalent of a mad scientist. Day after day, I work in our kitchen located in the Waterfront in Homestead, PA, with our manager of menu development, John Frick. We work at combining hundreds of ingredients in an effort to come up with the next big hit. Now and then, the flavors come together and a great taste sensation is created. That is the case with two of our burgers, the Black Angus Superburger and the American Grill. Now, with all the burgers out there, how are the best burgers chosen? As it turns out, that decision is made in Akron Ohio. Yes, Akron. Ohio. For the past three years, Akron has been the host of the National Hamburger Festival. The festival has become so popular that the Food Channel filmed a half hour feature from there in 2007. So this past July 19th, armed with my two favorite burgers, I traveled to Akron to wow the judges. I strongly feel that these are two of the best burgers I have ever eaten or created, but each has a very distinct background. The Black Angus Superburger came about partially as the result of a joke: John and I put it together just for the fun of it. We were presenting our new 6 ounce Black Angus patty to the menu development committee. To over-dramatize the size of the burger, I used two of the char-grilled patties on a double-decker bun in place of our classic Superburger patty. The resulting burger was huge. It tasted great. Everyone went wild for it. They loved it so much it went directly to the menu without any testing. That in itself was a first. The Black Angus Superburger has since become one of our most popular selections. The American Grill was one of the first menu items I developed for Eat’n Park back in 1997. But a little secret - the idea was not completely original. The American Grill is a char-grilled patty served between two grilled slices of yellow egg bread with sautéed dices of green pepper, sweet onion, and button mushrooms, all with a hint of yellow mustard. 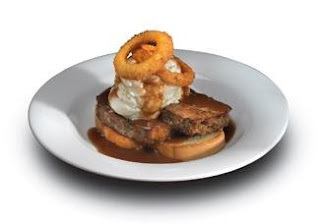 This burger was first served in my family’s restaurant back in the 70’s under the name “the hamburger special”. How original. It was the number one burger at Holden and Hall’s Pub. I knew that if it was loved there, it would be loved at Eat’n Park, so with a minor change in the bread, it became the American Grill.